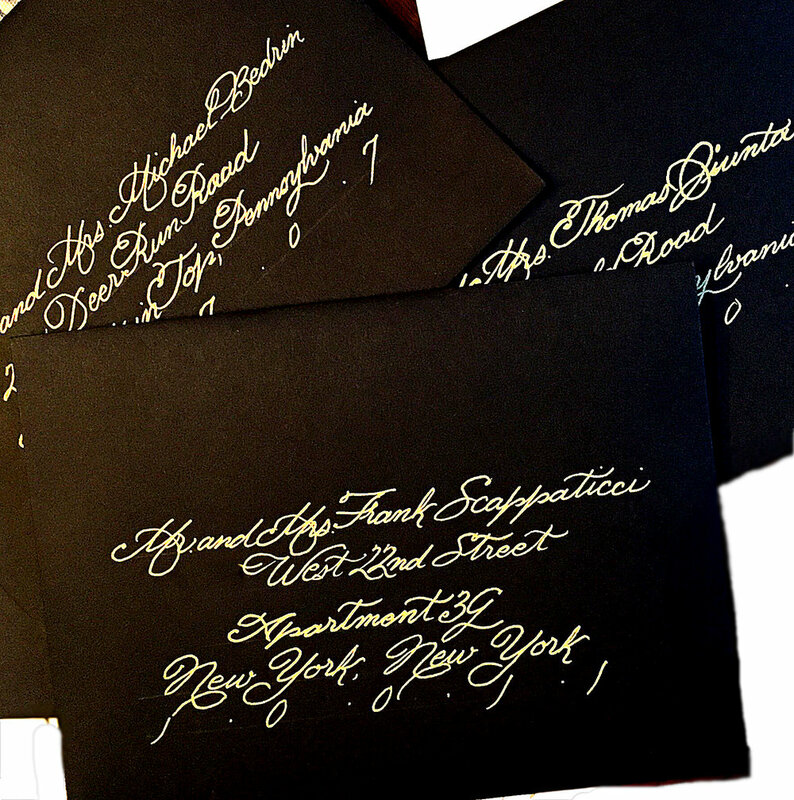 I have operated my calligraphy business since 2012 serving clients with hand calligraphy needs for weddings, showers, events, place cards, bar mitzvahs, and more. I have been practicing the art of calligraphy for close to 25 years, with my aunt being my first customer at 8 years old. I have worked with countless couples and want to make sure you are excited to send your invitations out. The addressed envelope is your guests’ very first impression of your wedding and your envelopes will make a striking introduction to your event.
. I offer services like envelope addressing, reception signage, any written details, handwritten lyrics/poems, and writing on canvases. I am an artist, a calligrapher, and a teacher. I have fun with every job I commit to and I am happy to work with you regarding budget, job, and expectations. Mistakes are inevitable! Please try to order 20-25% extra envelopes in case of mistakes, additions or changes. My calligraphy service takes approximately 10-14 days depending on the quantity of your order and my work load at the time. Your invitations should be mailed 6-8 weeks in advance, therefore starting 12 weeks before your date would allow plenty of time for both you and me. If there are any alterations/mistakes on your part, you will be charged for those already completed, along with the ones that will be redone. Any errors on my part will be fixed immediately and you will not be charged. Standard ink colors are: black, chocolate brown, sepia, red, orange, yellow, green, blue, purple, gold, silver, copper, and bronze. A $50 mixing fee will apply for custom ink colors. Please note that all work is done by hand and so there is no way to guarantee that orders will be completed on this exact date. My standard turn around time is 2-3 weeks. A rush order is any order requiring completion in less time than this 2-3 week window. Rush orders are not actually rushed, I typically hire a sitter for my two children so I can work all day on your order. For this reason, there is typically $100-$200 charge for the rush service. You can choose from my wide range of fonts, or I can learn the font on your invitation. I typically charge $50 to learn a custom font, however, it depends on the complexity. All lists must be submitted in the exact format the client would prefer them written so please thoroughly check your list. Payment is accepted upon order submission via Paypal/Venmo/Check/Cash. Half of your payment is due prior to the start of writing due to the handwritten nature of our work. The other half is paid upon completion.